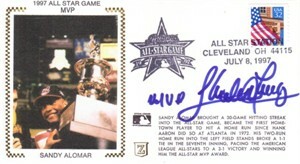 1997 MLB All-Star Game (played at Jacobs Field in Cleveland) commemorative cachet envelope from Z Cachets autographed in blue marker by Sandy Alomar Jr., who added MVP to his signature as he won Most Valuable Player honors at his home ballpark. MINT. With certificate of authenticity from AutographsForSale.com. ONLY ONE AVAILABLE FOR SALE.